* Air time: Fridays, 10.00 p.m.
39-year-old Ogata Satoko (Amami Yuki), is a highly capable psychiatrist who is single. She's forthright, a caring older sister and reliable in her job and in private. Her interests are staying in luxurious Japanese inns, and watching videos of stand-up comedy. Satoko hasn't had a boyfriend in the past five years. Nevertheless, she derives satisfaction from work, and isn't worried about her finances. 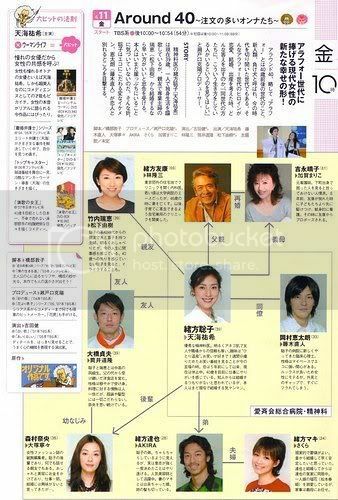 Among her good friends that she hangs out with are 35-year-old Morimura Nao (Otsuka Nene), her junior who proclaims that she won't marry, and 39-year-old Oikawa Sadao (Tsutsui Michitaka), her peer since high school days. Satoko is happily enjoying single life. At an alumni reunion as everyone is on the verge of 40, Takeuchi Mizue (Matsushita Yuki), her good friend since high school who is now a full-time housewife, rushes Satoko into action. "If you want children, you should marry now" and "It's women's happiness", but both are lost on Satoko who isn't convinced. Last edited by jade_frosts; 04-12-08 at 11:22 AM. I'm interested in watching this series for one reason: Naohito!!! This is a bit like Love Revolution where Naohito was also paired up with an older woman. I hope there's similar chemistry between him and Amami Yuki. 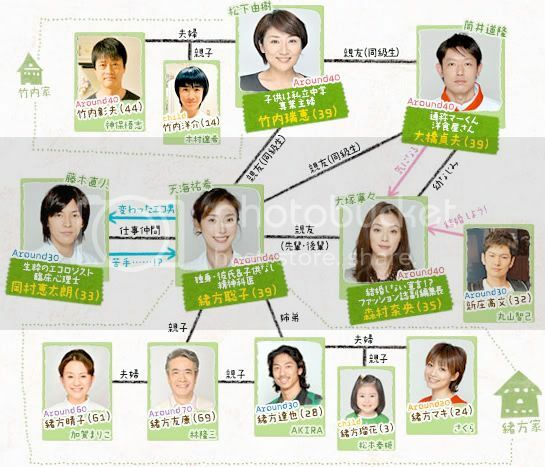 A new TBS drama starting in April is about the so-called around 40s, women aged 35-44. Around 40: Chumon no Oi Onna-tachi (Around 40: Women hard to please) features the problems faced by women in this age bracket, casually shortened to the "ara-four" generation. The women of the ara-four generation live in an era when economic growth and social advances have given them more choices in life. But some such women find themselves bewildered by an overabundance of choices. The new drama airs from 10 p.m. on Fridays beginning on April 11, and stars Yuki Amami as the lead character, Satoko Ogata, a 39-year-old single psychiatrist who is fulfilled in both her career and private life. As the series begins, Satoko is perplexed to find that her friends pity her because they see her as a miserable woman who has given up on marriage and motherhood. She also becomes ill, which leads her to worry about her age. The drama comically and sometimes bitterly portrays Satoko and other ara-four women who worry about their lives and think about where they might be if they had chosen different paths. The cast includes veteran actors Naohito Fujiki, Nene Otsuka, Michitaka Tsutsui and Yuki Matsushita, as well as newcomer Akira--a performer in the music and dance unit Exile, acting in a drama for the first time. Amami has played unusual and eccentric characters in many dramas, including a lawyer in Rikon Bengoshi (2004, Fuji TV) and a teacher in Joo no Kyoshitsu (2005, NTV). This time, however, Satoko in Around 40 is an ordinary woman. The actress, who is 40 herself, says: "I spent the age of 39 without seriously worrying or feeling pressed. I think this drama will be enjoyable for anyone, whether they are of that age or not." Explaining how he came up with the idea for the drama, producer Katsuaki Setoguchi said: "There were many women around me who gave birth to their first babies or seemingly suddenly got married around 40. Some women seemed to have completely changed their view of life after recovering from an illness." Many of the women told him that 40 is "a big turning point for women." "The number of possible life options for them has increased, but they don't seem to be satisfied with their lives. I thought that was interesting. This [dramatization] project is one we can do right at this very moment, when society is paying attention to the issue," he said. Since he started organizing the project, he has met more than 300 people in the course of his research. Ninety percent of them are women, including housewives and doctors. He also has received many requests from TBS employees to meet and talk with their friends or acquaintances of the age. "They don't [usually] talk much about their feelings, but they actually do want to speak their minds. That's what I felt," Setoguchi said. The producer says he wants to tell such "ara-four" women that "it's OK to stay just the way you are." "[Through this drama] I want to help them realize that their mindset can change their lives." A clinical psychologist who has just joined Satoko's hospital. He is popular with ladies because of his good looks. However, he is fastidious, untactful and even good at household chores because he grew up in a family with three olders sisters. He is deemed a "man who cannot get married" by Satoko. Satoko's good friend since high school. She's now a full-time housewife and mother of a son. She has a bright and cheerful personality and is talkative but finds herself suffocated by her current life. She feels worried for Satoko who isn't displaying any anxiety about turning 40. Satoko and Mizue's classmate in high school. He inherited his father's western restaurant. Mild-mannered and collected, he shows more passion for food than for people. He has always carried a torch for Satoko's good friend, Nao. A nurse. Eight years ago, she nursed Satoko's ill-stricken father, Tomoyasu, and he proposed. She is Satoko's trusted confidant. Satoko's father. He is a physician who runs a clinic in a residential area in the outskirts of Tokyo. He had been a prominent doctor at a university hospital when he was young but after his wife died when he was 46, he opened a clinic in order to devote himself to raising their children. Satoko's younger brother. He is a popular hairstylist and also does his sister's hair. He may look sloppy but he is strong-willed and will definitely set out to complete what he's decided to do. Maki was pregnant before he married her. Satoko's sister-in-law. She had always hoped to marry early and settle down. She pampers her daughter. After she married Tatsuya, she moved in to stay with his parents and leaves the household chores to her mother-in-law. She's very concerned about Satoko's marriage. In the new drama series, "Around 40" (TBS, Friday, 10 p.m.), whose subtitle states its case succinctly: "Chumon no Oi Onnatachi (Women Who Demand a Lot)", Satoko (Yuki Amami) is a 39-year-old clinical psychologist who hasn't been involved in a romantic relationship for five years and prefers it that way. She loves the single life and hanging out with her friend Nao (Nene Otsuka). In the first episode, Satoko attends a reunion of junior-high-school and high-school classmates. There she meets her former best friend, Mizuho (Yuki Matsushita), a housewife. Shocked that Satoko is still single, Mizuho tells her that if she ever wants to have a child, she'd better start thinking about getting married right away. The comment plants a seed in Satoko's brain. The press conference for Around 40 ~ Chumon no Ooi Onnatachi ~, which starts on 11 April, was held in Tokyo yesterday. Cast members Amami Yuki, Fujiki Naohito, Otsuka Nene, Tsutsui Michikata and Matsushita Yuki attended the event. The drama illustrates the generation of women around 40 faced with a variety of choices such as career, love, marriage; and the way each of them search for happiness. Hashibe Atsuko, who also wrote Fuji TV’s Boku series (Boku no Ikiru Michi, Boku to Kanojo to Kanojo no Ikiru Michi, and Boku no Aruku Michi), is in charge of the script. Meanwhile, Fujiki, who plays Okamura Keitaro, a newly-arrived clinical psychologist at the hospital Satoko works at, when asked about the appeal of females around 40 said, “It’s hard to talk (in front of Amami, Otsuka and Matsushita). Everyone’s really youthful …! When the three of them are together, they’re always constantly talking so I can’t break into their conversation. I feel them enjoy life and think isn’t this a fantastic age?" He seems at once overwhelmed by women around 40. The theme song, Shiawase no Monosashi by Takeuchi Mariya, goes on sale on 21 May. Lead actress, Amami, also lent her vocals for the chorus. Last edited by jade_frosts; 04-08-08 at 10:41 AM. "A women's market value drops steadily from 35? That's silly!" These were Amami Yuki's shocked words in the TBS drama, Around 40 ~ Chumon no Ooi Onnatachi ~ which started airing on 11 April, at 10.00 pm. This drama comically and sometimes bitterly depicts the woes and conflicts of the present Arafo generation when they face the choices of career and love, marriage, childbirth and child rearing. Representing the Arafo generation is Amami, who plays a 39-year-old single woman on the verge of 40. The scriptwriter is Boku no Ikiru Michi's Hayashibe Atsuko, and the producer is Setoguchi Katsuaki who worked on Hana Yori Dango and Karei Naru Ichizoku. On 7 April, the press conference was held in Tokyo and brought together a stellar cast of performers - Amami, acting in her first TBS production; Fujiki Naohito; Otsuka Nene; Tsutsui Michitaka; and Matsushita Yuki. Arafo, the abbreviation of the drama's title, Around 40, is a word coined to refer to females between 35 to 45. Arasa, which the fashion business collectively calls females around 30, was derived and created from this word. The Arasa were the generation of obsessively trend conscious teenage girls who set the trend for pocket pagers, loose socks, dyed brown hair and photo stickers. They are getting noticed for their quick consumption cycle and increasing spending power after entering the workforce. On the other hand, the Arafo spent their youth in the 80s. After their teens, the Law for Equal Employment Opportunity of Men and Women was implemented, and their job hunting period was at the peak of the bubble economy. The maternity and childcare leave system became widespread, women actively participated in society and new lifestyles were established. One can say that they are the generation that is a symbol of the times for being called "shinjinrui (the younger generation who have different ideals and sensibilities)" for their new values, and ridiculed as "makeinu (unmarried women over the age of 30 with no children)". However, they are a generation with many disillusions towards career, marriage and childbirth despite the acceptance of their diverse lifestyles and values and greater choices available. Around 40 ~ Chumon no Ooi Onnatachi ~ is a drama that focuses on these "disillusions". For the production of this drama, interviews were conducted with close to 500 people of the Arafo generation to thoroughly examine their worries and conflicts in order to create a story that would strike a chord, but this theme about the woes and conflicts of females around 40 is apt to be dark. Does he sense this? Setoguchi said, "More than lamenting about the things one doesn't have, one ought to focus on the things one has. Cherish it, go on living. That's a really beautiful life." The drama's underlying theme is positive thinking and he warmly mentions that he wants to make a drama to spur viewers on through the portrayal of the Arafo generation living a forward-looking life in spite of their troubles. An outstanding psychiatrist. Satoko is the sort who'd say what needs to be said regardless of status or plight. Because of that, her patients as well as the doctors and nurses who are her colleagues have great faith in her. In her personal life, she is a reliable older sister. But she isn't good at love and hasn't had a boyfriend in five years. Satoko doesn't feel great urgency to marry but urged on by her surroundings, she for some reason begins to feel a sense of disquiet ... Her hobbies are staying in luxury Japanese inns and watching videos of stand-up comedy alone. Sadao's nickname is Ma-kun. He runs a Western restaurant, Guranpon. He was classmates with Satoko and Mizue in junior and senior high school and Nao's neighbourhood childhood friend. Guranpon was handed down from his father to him, and the place is a great haven for Satoko, Nao and Mizue. He is unusually passionate about his restaurant and cooking but doesn't take care of his dressing, hairstyle and outer appearance. Sadao is, in every respect, genial, kind and passive (especially towards women). He always provides a listening ear to the complaints of Satoko and Nao. His favourite phrase is, "It's not the looks but the heart that's important." Satoko's good friend. She lives with her husband, a salaryman, and son. On the verge of 40, she feels very scared of turning 40. Mizue has devoted most of her time to her husband and child all this while. Now that child rearing has to a sense been settled, Mizue suddenly looks around and finds herself with time to spare. She feels a vague unease and could this be a sense of frustration at being in some way left behind by society? Satoko's younger brother. A hairstylist. Tatsuya is free-spirited and somewhat of a maverick. He seems flighty but once he has decided to accomplish something, his resolve is unwavering. Three years ago, he had a shotgun marriage with Maki, who also works at the same salon. After he became a father, his stance completely changed and he became worried about his older sister's seemingly carefree attitude towards marriage and life. Maki is a practical and shrewd person. She snared the fast-progressing Tatsuya at the salon that she worked at as an apprentice and had a shotgun marriage. Maki lives together with him in his parents' home. Tomoyasu and Haruko somehow tend to get caught up in Maki's pace but because of her inherent charm and gaiety, she sets the mood in the Ogata household. A general practioner. He is patient and genial. When Tomoyasu was young, he was a top surgeon at a university hospital but decided to switch to be a physician after his wife died when he was 46. To be able to concentrate on raising his children, he opened a clinic at his home. He brought up Satoko and Tatsuya while running his medical practice. Tomoyasu has known Haruko since his time at the university hospital. When he was past the age of 60, he came down with an illness. Haruko took care of him and he proposed that she be his life partner and she readily accepted. Satoko's step mother. A former nurse. She got to know Tomoyasu at the university hospital. Haruko is an accommodating and compassionate person who cannot let things be when she sees the weak and those in trouble. As a parent, she has a different sense of distance because she watch Satoko and Tatsuya grow up and helped a great deal with them. It's probably due to her experience as a working woman that she's always the first to sense Satoko's troubles and understand her well. The daughter of Tatsuya and Maki. Satoko's niece. She's a 3-year-old who loves drawing. A well-known lifestyle producer. Takafumi loves Nao and asked her to marry him. He has been repeatedly and harshly rejected but when Nao doesn't become the editor of a new magazine, she consents to marriage. Mizue's husband. Because he's a salesman at a life insurance company, he often has his meals outside. He purchased a house and sends their son to a private junior high school for Mizue's sake. But he and Mizue seldom converse. Even when he's at home, he's often on the phone or reading manga. A second year student at a private junior high school. He has been attending cram school since he was a fourth grade elementary school student and qualified for fine private junior high school. Even though he works hard his present grades are about average. He doesn't touch the lunch boxes made by Mizue and is always eating bread for lunch. He also eats out for dinner. In Around 40 (Fridays, 10 p.m., TBS), Yuki Amami plays Satoko Ogata, a busy, upbeat 39-year-old doctor who still plans to marry and have kids but just has not found the right guy. When her best friend's career stalls and she makes a quick decision to wed at 35, Sakoto finally begins to panic, yet is loath to settle for an arranged marriage. Despite the preseason hype, this series got off to a slow start with too little action and too much time devoted to careful characterization of Satoko and her friends, who grew up in the booming 1980s. Satoko does not meet new coworker Okamura (Naoto Fujiki) until five minutes before Episode 1 ends. He will likely become the romantic interest in her life but all we know about him so far is that he is into ecology. Episode 1 Synopsis - "I'm pitiful?" 39-year-old Ogata Satoko, is a highly capable psychiatrist who is single. She's forthright, a caring older sister and reliable in her job and in private. Her interests are staying in luxurious Japanese inns, and watching videos of stand-up comedy. Satoko hasn't had a boyfriend in the past five years. Nevertheless, she derives satisfaction from work, and isn't worried about her finances. Among her good friends that she hangs out with are 35-year-old Morimura Nao, her junior, and 39-year-old Oikawa Sadao, her peer since high school days. Satoko is happily enjoying single life. At an alumni reunion as everyone is on the verge of 40, Takeuchi Mizue, her good friend since high school who is now a full-time housewife, learns that Satoko eventually intends to have children of her own and rushes her into action. "If you want children, you should marry now!" and "It's women's happiness", but both are lost on Satoko who isn't convinced. However, Satoko is stunned when Mizue comments that their classmates view her as a pitiful woman who has given up on getting married and having children. One day, Satoko attempts to cheer up Nao, who is upset that she has been passed over as the chief editor of a new magazine for women around 30, and goes to her favourite hot-spring inn. But there, she coincidentally encounters a breakup between a handsome but somewhat environmentally conscious odd man and his girlfriend over his perceived stinginess, and surmises that he is a man who cannot get married. At a birthday celebration for Mizue a few days later, Nao announces her plans to marry Shinjo Takafumi, a famous lifestyle producer. She confides that she began to seriously consider marriage after her career setback. "It's my last chance at marriage. I'm already 35. I don't want to have any regrets later on that I didn't marry." The celebratory mood turns tense when Satoko asks Nao if she'll be happy. After the wedding ceremony, Satoko spends the night at her favourite hot-spring inn and ends up missing her train back to Tokyo. She starts to sob as she sits at the train platform, and is seen by that man. the character look good... but the story look not that good. but i'm kind interesting to see it.. Aware of what should have been private moments that they wouldn't want to be caught seen in by each other, Keitaro, who has come to replace the retired clinical psychologist, and Satoko clash over almost everything. At the welcome party for Keitaro held by the hospital staff, everyone is initially impressed with his environmental consciousness but they are soon taken aback when Keitaro tells them to order only what they can finish eating and takes out empty containers to store any unfinished food. With Nao's marriage, Satoko stops holding out for a "spontaneous encounter" and secretly joins a matchmaking agency. She takes part in a speed-dating party but something within her bugs her. Then she receives a phone call from Nao who says that she wants to introduce her to a man. The other party is a lawyer by the name of Oshima. He is a divorcee with no children and a man with good repute. The next day, Satoko is introduced to Oshima in Nao's presence. They eventually are alone at a place where they can take in the night view but Satoko feels awkward because it has been a long time since she went on a date. Seeing that Satoko is unsettled, Oshima gently talks to her and she silently murmurs "shoulder width okay, everything okay" as she gazes at his profile. A few days later, Oshima asks to date Satoko with marriage in mind. Satoko is thrilled but something he says makes her change her mind and she turns him down flatly despite Nao's words of caution. could find the series ? is this series already came out? Yes it is already screening in Japan. Ep 4 will be shown this week. I think this series is pretty good so far. Naohito looks really cute and young in here. More screencaps of his character, onegai shimasu. It's so sweet and hilarious how he's so obsessed with environmental protection. Of course I probably wouldn't use those exact words if I came across such a person in real life. Yeah! He's quite a character. I loved the two scenes at the restaurant in Ep 2 and I was really amused at how he kept making references to each of his older sisters when making his observations of Satoko. I don't see how these two can remain at loggerheads for long. Satoko frets that she'll have to lead the rest of her life alone because she can't find anyone she likes. In desperation, she consults a fortune teller in an alleyway who advises her not to be presumptuous or she'd unwittingly pass up on good men who come her way. Shun, a boy who suddenly lost his ability to speak, comes to the psychiatric department Satoko works at accompanied by his teacher. Satoko tells him that she wants his parents to come together with him for a consultation but Shun arrives alone. Believing that he'll be able to identify Shun's problem if he interacts with him, Keitaro arranges regular game sessions at the hospital grounds with the boy. Satoko objects to Keitaro making further contact with Shun without the permission of his parents since it could infuriate them and stir up trouble. However, Keitaro ignores hospital policy and makes contact with Shun following the way that he believes in. One evening, Keitaro visits Shun at home when he finds that the boy has left the hospital without waiting to play their game of catch. Shun's mother makes a complaint to the hospital. As Satoko and Keitaro get into a disagreement over the way to handle Shun's matter, Keitaro gets a call from the boy. Satoko decides to follow Keitaro to Shun's home where they find his mother unconscious. The hospital's deputy director decides to sack Keitaro over the incident but Satoko defends him and says she will bear the responsibility. This is overheard by Keitaro. Meanwhile, a frustrated and lonely Mizue starts going to Keitaro's counselling room. Mizue is comforted through the advice received at the sessions and gradually falls for Keitaro. She starts paying more attention to her appearance. Satoko catches sight of Mizue and Keitaro at the hospital entrance one day and realises that the patient Keitaro had referred to as being interested in him is none other than her good friend. She tells Mizue that it is common for patients to have such feelings during treatment but Mizue accuses her of being jealous. With the concept "Women's happiness is having work, marriage and children", Nao gambles on starting a new magazine with herself as the symbol of this happiness. Sadao detects a sense of apprehension in her when she turns up at his restaurant after visiting the gynecologist.